Equipment has always been an asset to businesses. It is said that maintaining and repairing equipment take a substantial part of the costs needed to operate a business. Companies, therefore, create a schedule to prevent costs in repairs. 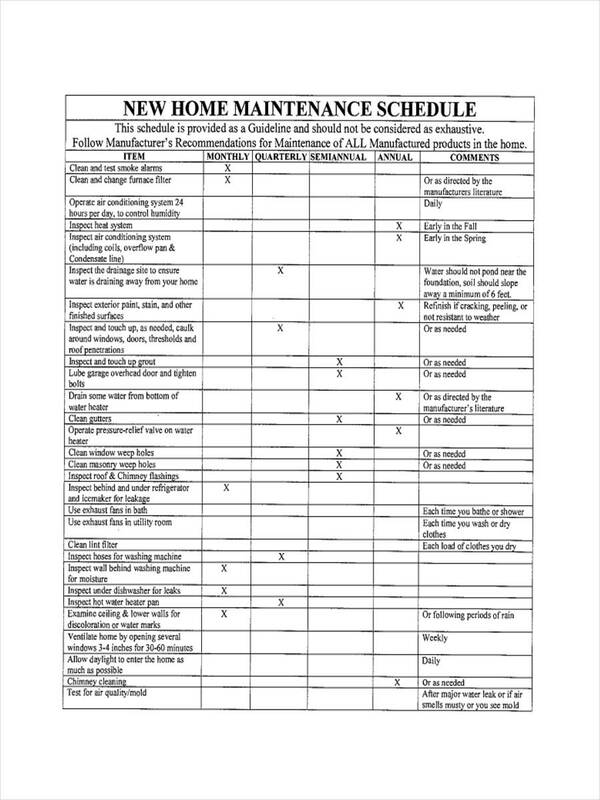 Thus, we have the preventive maintenance schedule in place. A flexible schedule example is ideal in doing maintenance work, but operation in a business is never flexible. Doing maintenance work means downtime and translates to losses for a company. Having a preventive maintenance schedule reduces downtime and equates to better productivity and output in a manufacturing or any kind of business. 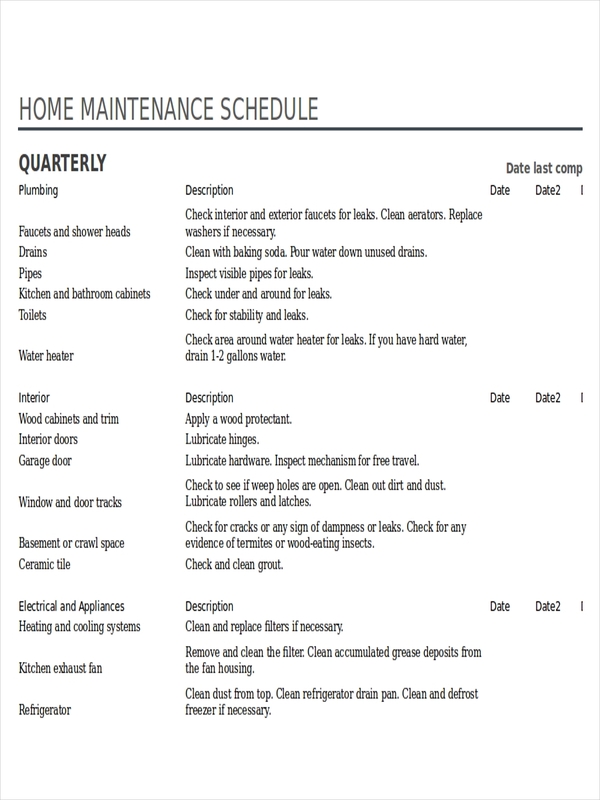 What Is a Preventive Maintenance Schedule? 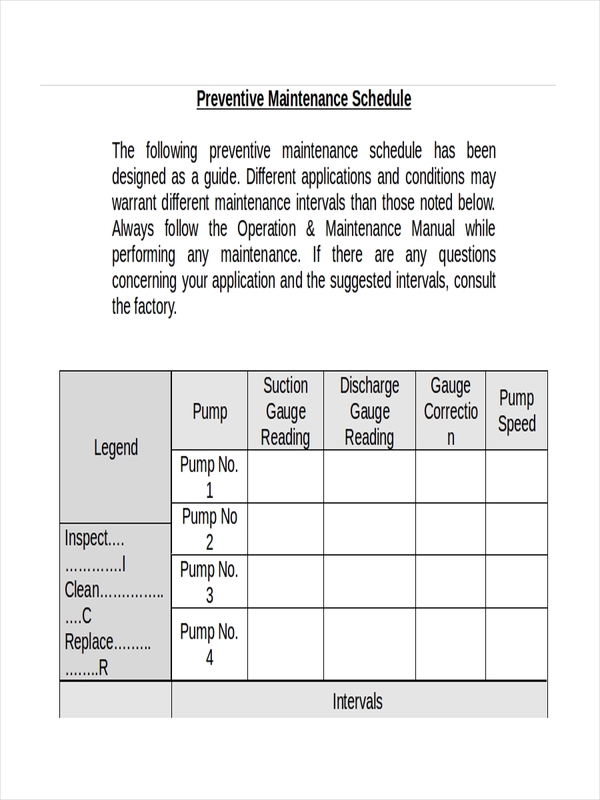 A preventive maintenance schedule is a scheduled maintenance or service check of an equipment. Preventive maintenance periodically checks an equipment to ensure that the equipment is operating properly and to avoid unscheduled breakdown of the machine, which causes downtime in business operation. 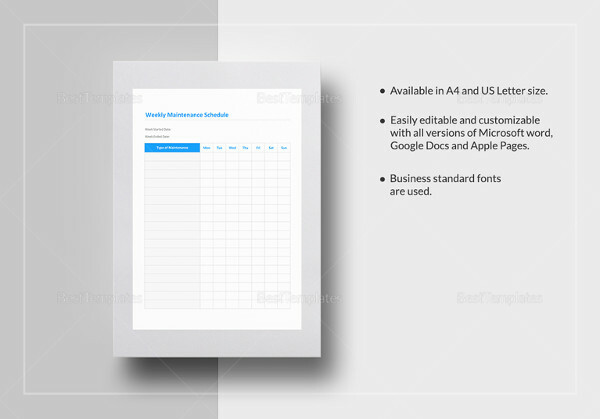 Schedule examples in pdf and particularly activity schedule examples may draw inspiration and give more information regarding a preventive maintenance schedule. Prepare an inventory of the items used daily in the business. 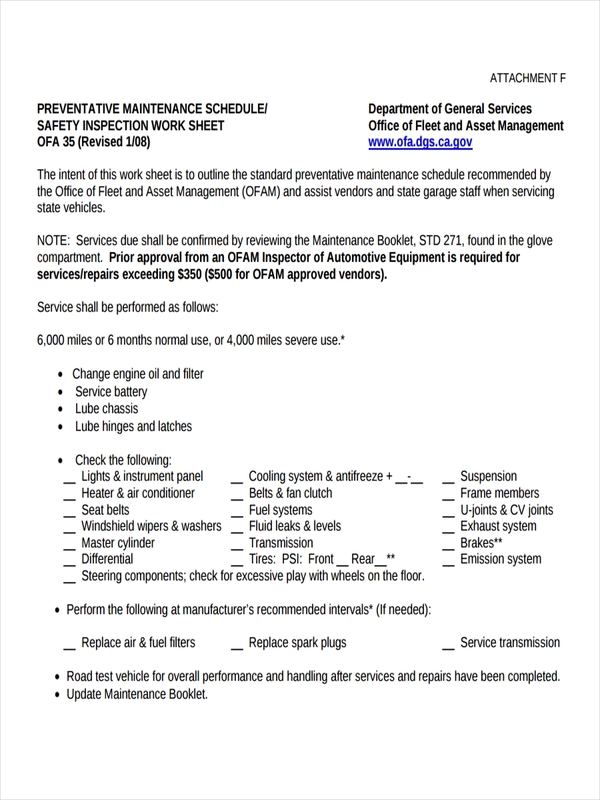 Get all equipment in condition for a maintenance program. Formulate a maintenance program depending on the equipment to be worked on. Stick to that program to avoid any downtime. 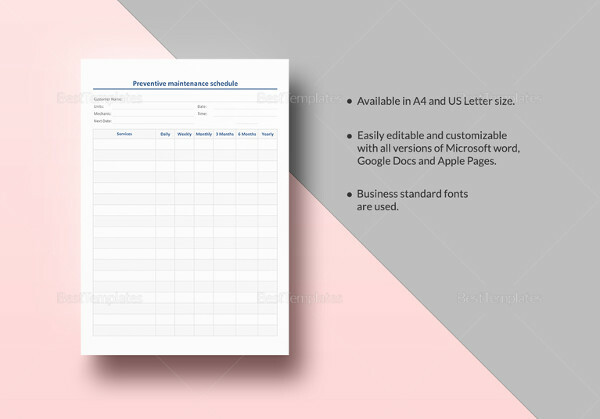 There are sample schedules and program schedule examples shown in the page for your perusal. 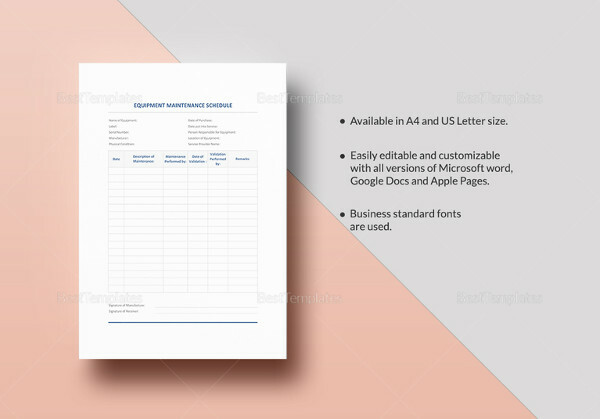 Just click on the download link button below the sample to access the file. 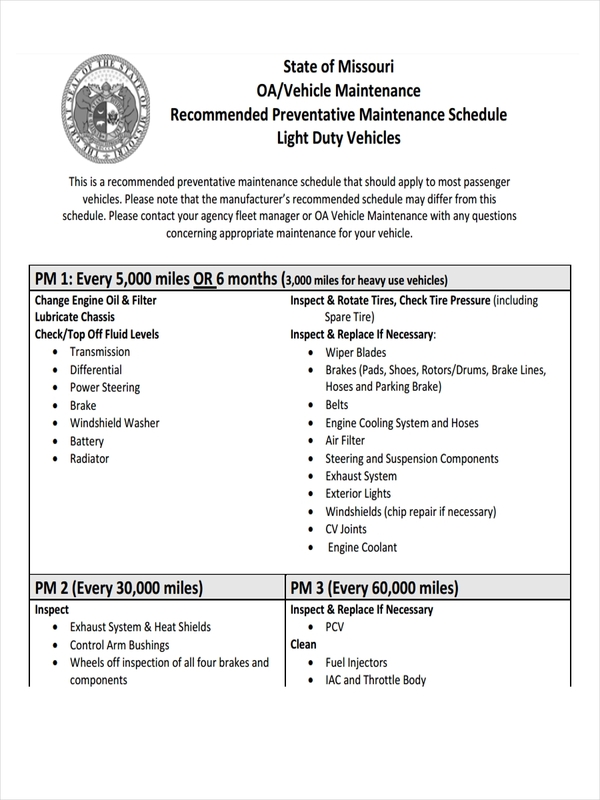 Having a regular preventive maintenance schedule certainly helps a company or business in more ways than one. Repair costs – Ideally, repair costs would be eliminated as a properly maintained machine should run smoothly and have no problems. In real time, accidents do happen but repair costs should be significantly reduced due to proper maintenance. Better productivity – Reduced downtime due to machine breakdown would be virtually eliminated thus translating to better productivity for the company or business. Higher plant efficiency – The overall efficiency of a company should effectively be higher since personnel can concentrate more on what to do rather than be bothered by downtime. An operator therefore is able to do his task without disruption and maintenance personnel can focus on more urgent matters. Significant time savings – Last but definitely not the least, time is saved on both operations and maintenance personnel. Having a well-maintained plant saves on time which essentially cannot be bought. 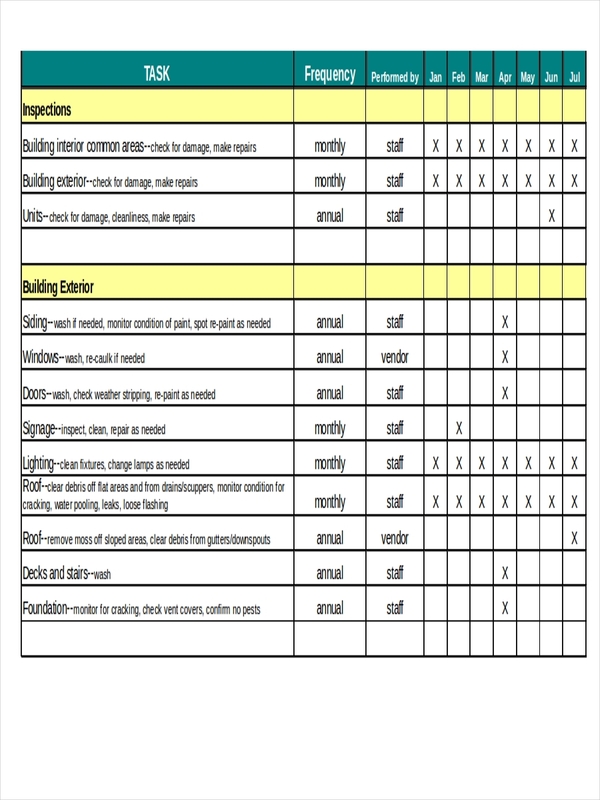 Hourly schedule examples help provide more understanding in the making of a preventive maintenance schedule. 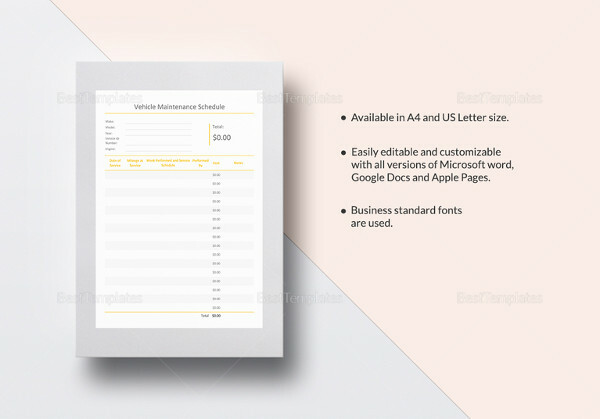 Clicking on the download link button allows you access to the file for further reading.